When you apply for a home loan modification, you will need to prepare financial statements for the mortgage lender that list your household income and expenses. The decision of whether your lender agrees to a loan modification and the terms you ultimately agree on comes down to numbers. If your lender has its own financial forms, use those instead of preparing your own. Using the correct forms may make the difference between having your application approved or rejected. Contact your lender or visit their Web site to see whether it has downloadable financial forms. 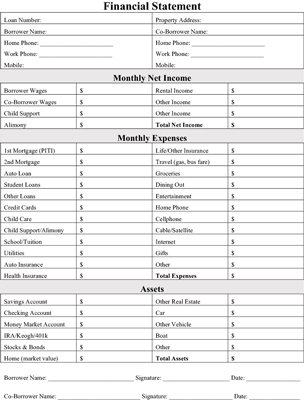 Many lenders require only one financial statement: a detailed account of your current monthly income and expenses along with a list of anything valuable you own and how much it’s worth. You can use the following sample financial form to supply the details that most lenders require. Click here to download and print this form. Some lenders want additional information, including your employer’s name, your current job title, and how long you worked at your current (or former) job. They may also want Social Security numbers, driver’s license numbers, and to know whether you’ve filed for bankruptcy. The only item in the above form that’s likely to trip you up is the first one under Monthly Expenses: 1st Mortgage (PITI). PITI stands for principal, interest, taxes, and insurance. If part of your monthly payment goes into an escrow account to pay your property taxes and homeowner’s insurance, the PITI amount is equal to your monthly payment. If you pay property taxes and insurance separately, total the amount you pay in taxes and insurance for the year, divide by 12 months, and add the result to your monthly house payment. When making estimates on your financial statements, don’t overanalyze. Use realistic numbers so you don’t end up committing to something you can’t really afford. Every lender has its own affordability thresholds to determine whether you have sufficient income to afford your house payment. If you’ve hired expert representation, your representative is likely to know the lender’s affordability threshold and be able to massage the numbers in your financial statement to qualify you while still providing an accurate representation of your budget. Lenders often want to see a projected financial statement illustrating the budget sacrifices you’re willing and planning to make to regain your financial footing after the loan modification. For example, you may be planning to sell one of the family cars to eliminate a payment and save a little on auto insurance and maintenance, trim the grocery bill by a couple hundred bucks a month, cut back your dinner-and-a-movie dates from twice a week to twice a month, and so on. After you have a current financial statement, creating this projected statement should be much easier. Add income to the categories where you realistically think you’ll be pulling in more income (if any), and trim back in the expense categories where you realistically think you can save money. And don’t forget to account for that lower house payment resulting from the loan modification.